Together, Palestinian and Israeli women unite at Bil'in to oppose the wall. Palestinians at Bil'in march every Friday to protest the injustice of confiscation of their farm lands. Resistance by Palestinians, Israelis, and internationals is growing to Israel's illegal military occupation, providing a hopeful look at what might happen if activists adopted a disciplined, organized nonviolent process on a national scale in the occupied territories. Given that the Palestinians already have a significant legacy of nonviolence from the first Intifada, such a movement is plausible. The first Intifada was "largely" free from violence. However, stone throwing was practiced frequently. (See "The Controversy of Stone Throwing.") As the first Intifada wore on, the commitment to nonviolence seemed to weaken and some elements of clear-cut violence entered the picture, such as when Palestinians used Molotov cocktails (petrol bombs) and injured or killed Palestinian collaborators to punish and deter further betrayal of their cause.5 Relative to the entire scale of the nonviolent activities, Sari Nusseibeh noted in 1989, "The voice of violence on the Palestinian side is still peripheral. "6 That said, even 'peripheral' or 'minor' intrusions seem to compromise the 'purity' of one's nonviolence and the movement's effectiveness. One key factor in a nonviolent movement's success is positive media coverage and the resulting international support. Time and again, we've observed that if a nonviolent movement includes violence, the media will focus almost exclusively on the violence. Thus, from a strategic standpoint, disciplined movements tend to be more successful, such as the Philippines People Power movement that ousted Marcos (see p. 20) and the Eastern European revolutions that brought down Communist regimes in the Czech Republic and Poland in the late 1980s. Although it was not as disciplined as other movements, the Intifada was quite successful in many ways. The "David versus Goliath" imagery helped to generate international sympathy for the Palestinian cause. The Palestinians established the legitimacy of their aspirations in the minds of people around the world, built internal commitment and solidarity, created social structures, inspired left-wing Israelis to work on behalf of a resolution to the conflict, and achieved recognition of their political leaders. Unfortunately, the ensuing political process that led to the Oslo Accords in 1993 did not result in the end of Israel's occupation of the West Bank and Gaza, but according to some, helped to entrench the conflict by deflecting international awareness away from the reality of Israel's ongoing illegal expansion of settlements. This result did not reflect a weakness in the effectiveness of nonviolence, but in a failure of nonviolent actors to follow through when it became clear that negotiations wouldn't succeed.7 This has, in fact, been a common failure in nonviolent insurrections post Gandhi. Given that for many members of the Palestinian society, the first Intifada was an endeavor of strategic nonviolence (lack of available guns may have been the primary motivation to embrace nonviolence, not a belief in its power to reach hardened hearts), it was almost predictable that some Palestinians threw up their hands in frustration when the Oslo process failed to deliver them a state and began a struggle far more marred by the use of arms (the second Intifada, 2000-2005). Be that as it may, the results of that armed struggle and Israel's overwhelming response have been devastating to Palestinian society, especially in the occupied territories. Despite the more prominent violent components of the second Intifada, many Palestinians have practiced strategic nonviolence to resist military occupation and the wall in recent years. The world, moreover, has taken notice of the Palestinians' plight. In July of 2004, the International Court of Justice ruled that the wall is illegal and a violation of Palestinian human rights. 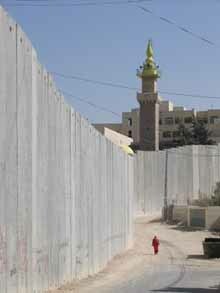 Israel claims that the wall is needed to protect its people from Palestinian suicide bombers. 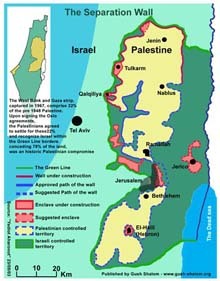 However, the wall is being built on the Palestinian side of the "green line," thus annexing Palestinian land de facto. In 2004 the residents of Budrus village successfully utilized strategic nonviolence to oppose the separation wall slated for construction on their lands. The wall not only threatened to confiscate most of the village's agricultural lands, but also cut the villagers' access to water resources, schools, universities, employment locations, and family. 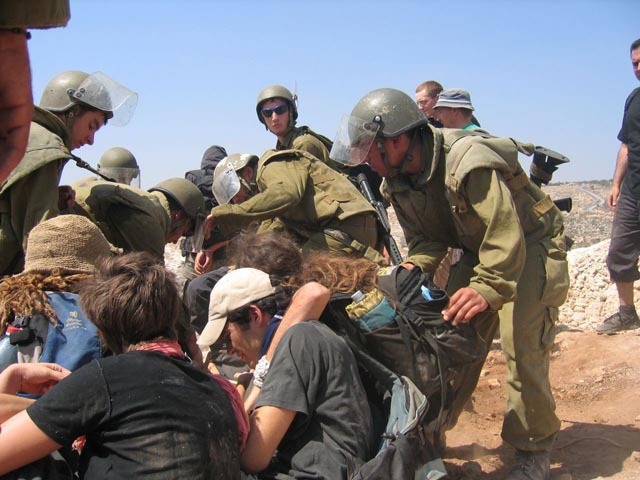 The residents of Budrus combined nonviolent political activism with a legal strategy that included daily and weekly demonstrations against the wall, and litigation against the Israeli government. The demonstrations brought together a coalition of supporters, including Israeli groups such as Ta'ayush and the Anarchists Against the Wall, international activists from the International Solidarity Movement, and members of both the Israeli Knesset and Palestinian Parliament. The political pressure from activists forced the Israeli Supreme Court to rule in favor of the Village of Budrus, and ordered the government to change the path of the wall to minimize the confiscation of Palestinian lands. 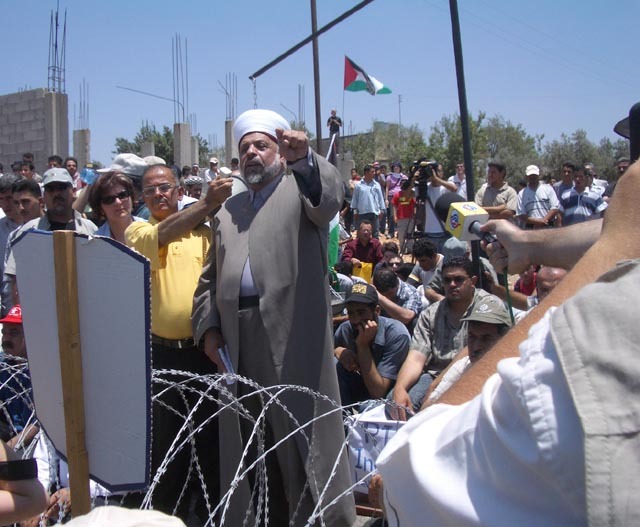 While it has yet to achieve its stated objective of rerouting the wall to save land, the Bil'in resistance movement has chalked up some very important small successes, including moments of favorable media coverage. 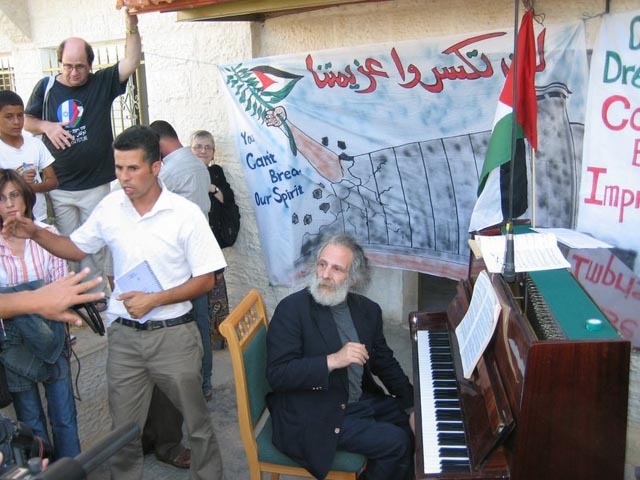 The Bil'in villagers have chained themselves to their olive trees, formed "human barrels," conducted prayer sessions near the route of the wall, and even held a volleyball match that deterred soldiers from entering the village.8 In September 2005, famous Dutch pianist and Holocaust survivor Jacob Allegro performed a concert at one of the demonstrations. Allegro said his mission was to oppose injustice and bring together people from all sides.9 Co-author of this story Taylor attended one of these demonstrations in July of 2005 (his account will be posted at: http://calpeacepower.org/ please check back). News reports have revealed Israeli military abuses, including undercover Israeli provocateurs who sneak over to the Palestinian side and cast the first stones (so as to provide the Israeli military a pretext to open fire). Independent media have captured Israeli soldiers severely beating and abusing activists, and then provided videotapes to refute Israeli military lies in court, including false accusations of protestor violence.10 The Bil'in resistance has made its way into the pages of Haaretz in Israel and The New York Times, providing a venue to expose the realities of the separation wall and Israeli military abuses of Palestinian human rights to the people who most need to learn about them: Israelis, US Jews, and international civil society. As powerful as media coverage can be in influencing international opinion in favor of the Bil'in struggle, perhaps we should not overlook the individual moments of "conversion" that occur when a resistor's courage reaches an oppressor's heart. We have heard reports of at least two off-duty Israeli soldiers or military employees who have come over to the village to join the people's struggle, and we suspect that as the Bil'in demonstrators grow in their dedication to nonviolence, their creative experiments will yield more goodwill and sympathy from the soldiers they face. As Palestinians seek ways to reach and convert the hearts of Israelis who support the occupation, they enter the realm of principled nonviolence. The nonviolent actor draws much of her power from the ability to resist the act, not the person in opposition. Stories abound of Palestinians, both leaders and common folk, who embrace this deeper level of nonviolence. For instance, Dr. Mohammed Abu-Nimer relates the tragic yet beautiful story of a Palestinian woman who saved an Israeli soldier from being stoned to death by an angry group of Palestinian youths. Only later, after offering the soldier coffee and providing sanctuary in her home, did the woman find out that moments before she saved the soldier, he had shot her son to death. In further research, Abu-Nimer discovered that this deep sense of heart unity that the mother shared with the soldier was far from isolated. A Palestinian named Ahmad told Abu-Nimer, "Religion and custom enable us to preserve our humanity.... This is why nonviolence is important to us. We will never become like the Israelis and hate our enemy; we will offer him hospitality. The soldier could come back again, and the woman would offer him coffee again. "13 It is in the homes, mosques, and churches that Palestinians embrace nonviolence through acts of kindness and deep faith in God and humanity. Obviously, not all Palestinians share Ahmad's views about respecting the humanity of Jews. 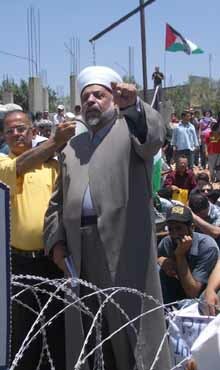 However, Abu-Nimer found that Palestinians frequently disclaimed hatred of the Israelis. Some of the comments he heard included, "We refuse to hate them; it robs us of our humanity; we will not become like them," and "at the funeral of my nephew [killed by soldiers], there was one soldier weeping; that is why we do not hate them." Many expressed respect for the Israelis as "worthy opponents" and not "dehumanized others. "14 It is these attitudes of respect and rehumanization of the adversary that provide a path to convert feelings of anger and bitterness into a positive desire to reconcile. Abu-Nimer notes, "If the oppressor recognizes these attitudes in the oppressed, the sense of threat is reduced and the willingness to resolve the conflict is increased. "15 While it may be the case that Israeli soldiers are "dominant" given their superior firepower and authority, many of them are frightened to the core during live confrontations with the Palestinians, and it is the positive attitude Abu-Nimer identifies that provides the soldiers a dignified climb-down to engage with the Palestinians as fellow human beings. According to Gandhi, when an oppressor cannot be reached by logic alone, one must appeal to the oppressor's humanity by acceptance of self-suffering in order to reveal the true nature of the oppression in a clear, unmistakable way to the oppressor and to the world. Abu-Nimer notes that the above positive attitudes of the Palestinians during the first Intifada contributed to a willingness to "bear more suffering than the opponent without retaliating in kind." This willingness seems apparent to us among many of Bil'in activists, who maintain their dignity without retaliating when the Israeli soldiers use excessive force. The grassroots resistance in Budrus and Bil'in could be a small but essential component of a large, but not yet fully articulated nonviolent movement that is starting to take shape in Israel/Palestine. A number of on-the-ground organizations such as Holy Land Trust, Sabeel, and the Israeli Committee Against Home Demolitions can help provide the organizational backbone for such a movement. A conference entitled "Celebrating Nonviolent Resistance" on December 27, 2005 in Bethlehem will provide a possible nexus for organizations and activists to coordinate their efforts. Stone throwing was one of the more controversial aspects of the first Intifada and remains a part of Palestinian resistance today. It is mainly practiced by Palestinian youths age 10-20 (called the shabab). Some Palestinians have argued that stone throwing is more an act of defiance than an intention to injure (the literal meaning of himsa, violence), saying that stones (in most cases) cannot hurt well-equipped helmeted soldiers. The shabab resort to stone throwing to protest the presence of the army on their lands. For Palestinian youngsters suffering from a deep feeling of humiliation and hopelessness, this simple yet concrete act of resistance is often a way to survive psychologically, by reclaiming a feeling of empowerment in an otherwise forlorn and depressive environment. Accordingly, different scholars note that stone throwing falls into a gray area between violence and nonviolence. Dr. Abu-Nimer refers to it as nonlethal force or unarmed resistance.17 Unfortunately it does have a real potential to injure. During the time we visited the holy land in the summer of 2005, one Israeli soldier reportedly lost use of an eye due to a stone. Even if such incidents are rare, the mainstream media tends to focus on them. In Bil'in, the debate about stone throwing takes place during rallies and everyday life. 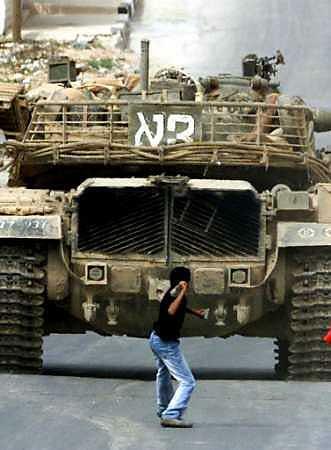 After one of the weekly demonstrations in July of 2005, for example, a long discussion took place between Palestinians, Israelis, and international activists about stone throwing in particular and nonviolence in general. Some of the activists argued -- correctly, in our view -- that stone throwing provokes the army. Additionally, they stated that the violent conclusion of each demonstration is the only part that gets media coverage, and draws public attention away from any meaningful discussion about the issue of the wall. In conclusion, although the village council affirmed a desire to stop stone throwing, they simultaneously justified and understood the youths' need to release their anger through throwing stones. The history of nonviolent movements suggests that the adults, who already model more deeply committed nonviolent action, could challenge the youths to do something useful, powerful, and consistent with the resistance -- something that could divert their rage and defiance into more constructive, less ambivalent channels. For instance, the youths could be asked to join the adults at the front of a march and carry out their defiance with courage and dignity -- hopefully even offering a measure of respect to Israeli soldiers as they do so. Nonviolence begins with the internal conversion of a negative to a positive drive, and engaged mentorship could help youngsters to make this journey. 2 Abu-Nimer, Mohammed. Nonviolence and Peace Building in Islam, page 131-132. Gainesville, FL: 2003. 7 "The accords signed by Israel and the PLO/PA appeared to serve dominant Israeli political and economic interests by essentially sidestepping the political issue of Israeli occupation in favor of self-rule for the Palestinians, within the context of continued Israeli control of territory and resources." Dajani, Souad. "Nonviolent Resistance in the Occupied Territories: A Critical Reevaluation," from Nonviolent Social Movements, edited by Zunes, Kurtz, and Asher (Blackwell Publishers: 1999). 8 Tyrer, Bex. 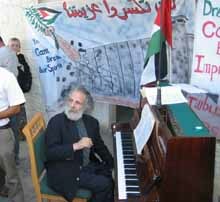 "Bil'in: A Lesson in Creative Resistance," Palestine/Israel News from Within, June, 2005. 10 Lis, Jonathan. 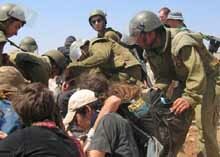 "Border police lie about about violence at fence protests," Haaretz, July 28, 2005. 12 Erlanger, Steve. "Dance of protest in West Bank," The New York Times and The International Herald Tribune, October 8, 2005. 16 Nagler, Michael. "Compassion: the Radicalism of This Age," Yes! Magazine, Fall 1998.